There are some great events coming up at one of Pembrokeshire’s favourite pub restaurants. See if you can resists some of these tasty dates at The Stackpole Inn. Don’t miss the fishy Fridays! Fabulous food in a lovely setting is what customers expect at The Stackpole Inn, which is in a beautiful setting in The Pembrokeshire Coast National Park. You can find all you need here from a light lunch in the bar to a delicious evening meal featuring a selection of local fresh caught seafood. Now selected Fridays are special fish nights at the Inn. You can choose from a range of fresh fish and different batters, served with real chips, mushy peas and tartare sauce, for just £10. Friday Fish specials are available on October 3rd, 17th and 31st; November 14th and 18th; December 12th and 19th. The full menu is still available on those nights too. The selection of fish on the menu at The Stackpole changes daily depending on the local catch – but you can be sure there is always something to tempt you. And look out for these up and coming dates, special nights all with live music – Halloween Party night on October 31st; a live music night on November 28th; and a Community Christmas Party on December 19th. Make a date now. For Christmas parties the Stackpole Inn has a great offer through December. The festive three course menu, complete with mince pies, crackers and coffee is just £18 a head. And on Christmas Day the gourmet menu, with bubbly and canapés on arrival, is £55. Bookings are being taken now, so don’t miss out! High quality cuisine, prepared using only the finest local produce and ingredients is on the menu year round here. The daily menu features a wonderful range to tempt the taste buds, from marinated mixed olives to cawl, fishcakes and home-made shepherd’s pie to sirloin steak, as well as the specials board with fresh fish selections. 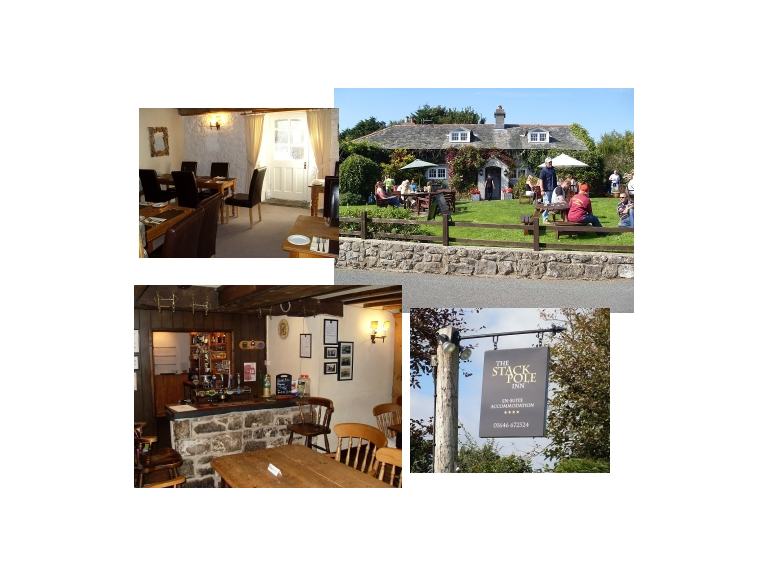 The Inn was awarded the title Best Gastro Pub in Wales and the title ‘Best Food Experience Pembrokeshire’ in 2011 by Pembrokeshire Tourism, both in 2011.